Now through September 5th, 2014 is the time to vote on panels & presentations for SXSW Interactive 2015. I have submitted a presentation for consideration and would greatly appreciate your support. My proposed topic is What Will Advertising Look Like in the Year 2020. This is an in-depth extension of my previously published iMedia article of the same name. Here is a brief outline of the proposed presentation. I will also roll out the new consumer engagement platform called #DatabaseOfYou during this presentation. Where should marketers and brands place bets over the next five years? What is hype over substance? Taking all of this into consideration, I interviewed my strategy teams in Los Angeles, New York, and Dallas to map the state of digital marketing in the year 2020. We had fun with discussions of drones, crypto currency, the internet of people, and more. While the team agreed fundamentally about certain platforms making an impact, there were pros and cons to impact and feasibility. The following panel is the consolidated and highly visual vision of the future of advertisting in the year 2020. This presentation will take a look back at transformational media moments that give clues to the future state of advertising. We will then look at the role of integrated mobile, converged media, connected life and the digital ecosystem of the future. Presentation Cameos by Drones, Terminators, the Jetson’s, Marty McFly, Grumpy Cat and more!!! The presentation will focus on the three predicted core pillars of advertising in 2020 (Content, Data, Channels). The pillars will fuel the discussion and points of connection between where technology is going and how to stay relevant with a information overloaded consumer. 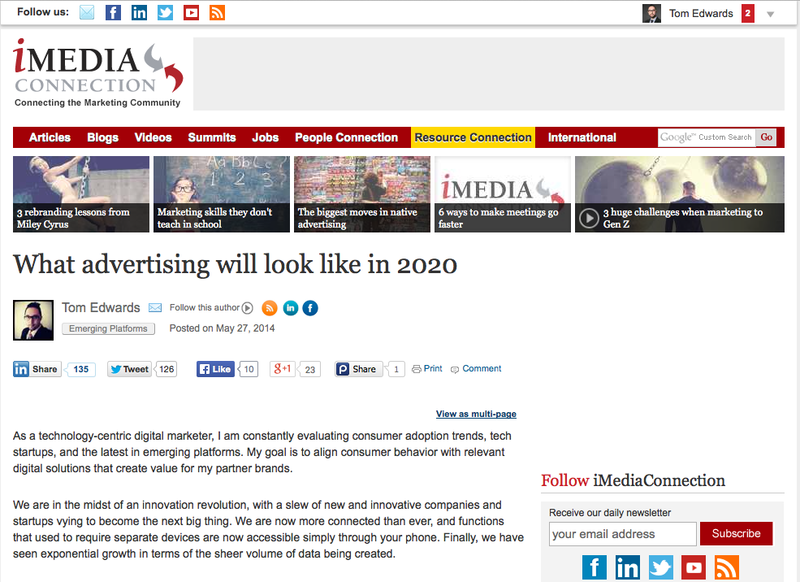 1) How can media of the past predict the future state of advertising? 2) What role will mobile + wearables play in 2020? 3) How can media fragmentation and personalization unlock new opportunities for converged media? 4) What role will the internet of things and connected life play in predictive advertising? 5) Who will be left standing as major players digital ecosystem players in the year 2020? Here is a preview of some of the initial visuals tied to the presentation. Then you can simply search for Tom Edwards and give it a thumbs up to submit your vote.